Although contemporary art continues to be defined by human agency, the notion of animal culture now serves as a point of departure for a range of artistic practices focused on multispecies aesthetics and interspecies communication. A well-known humanist truism states that there is no art in the non-human world. Indeed, when it comes to defining art, the notion that it constitutes a uniquely human activity often serves as a reassuring rock in a storm of contestation. Laurie Schneider Adams’ classic introductory text, The Methodologies of Art: An Introduction (1996), uses this assumption to exclude animal creations such as bird’s nests, ant hills, and beaver dams from the category of art. (1) “Spiders, unlike humans, are not inspired by aesthetic or narrative ideas,” she writes. “They neither observe the environment nor make a conscious choice to create the abstract geometry of their webs.”(2)More recently, French literary theorist Alain Vaillant has advanced an anthropocentric theory of art and laughter, which ties them both to humanity’s ability to liberate itself from the exigencies of “reality” and play with representations. (3) At the heart of such theories lies a notion of human superiority strangely at odds with the prevailing tenor of much contemporary art theory and criticism, which typically embraces otherness and encourages subversions of normative categories. While the spectrum of difference celebrated by contemporary art remains stubbornly anthropocentric,(4) few would argue that animals have no place in this world. Indeed, traditional art history narratives begin with depictions of animals – usually the iconic horses of Lascaux Caves – as well as objects made from their bodies, such as etched shells, or carved bones and teeth. While our relationship with non-humans may have changed more under capitalism than in all of human history, they continue to play an important role in art, usually as symbols of a social imaginary or as indexes of the real. In the first case, they tend to embody positive and negative attitudes towards shared cultural mores, institutions, and values. In the second, their actual bodies – documented, confined, taxidermied – confront us with the limits of this imaginary and its failure to grasp their otherness. While the goal of such art is usually to shock us, or make us question the status quo, its treatment of animals as media or mere things to be represented is far from innovative. Although contemporary art continues to be defined by human agency, the notion of animal culture now serves as a point of departure for a range of artistic practices focused on multispecies aesthetics and interspecies communication. The exhibition Animal Intent explores this trend through the work of seven artists who partner with non-humans in the creation of unique artistic projects. Rather than merely representing animals, using them as surrogates, or politicizing their bodies as part of a broad social critique, these artists treat animal instinct as a form of stylistic invention in its own right. Sapsucker Sounds, Annie Dunning’s playful “conflation of woodpecker and human culture,” is a good example of interventions used by artists in this exhibition. At its heart lies a pattern of holes dotting the surface of a log cut from a Manchurian walnut. These are the drill holes of a yellowbellied sapsucker, a North American woodpecker known both for boring into young deciduous trees and drumming on them and other surfaces as a means of declaring its territory. Dunning borrows these marks, which she treats as the residue of a specific cultural practice, and translates them into a series of quirky, interactive sound sculptures. Music Box (2014), for instance, features a negative cast of the pattern of holes that have been reconfigured as cylinder pins for a clunky, yet charming music box. Viewers may play this unusual musical score by turning a rustic ratchet lever, which forces an explosion of pins through a comb of metal tines. Aganetha Dyck’s twenty-year-long collaboration with honeybees takes a similar approach. 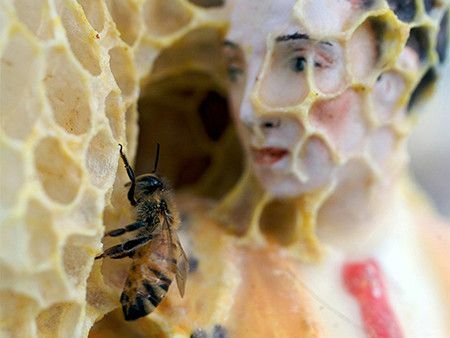 Working closely with an apiarist, she places found objects into the bees’ hives, where the insects slowly and meticulously transform them into baroque, honeycombed sculptures. In An Inconvenient Proposal (2007), a kitsch pastiche of 18th century rococo fashion becomes uncanny beneath the hexagonal “lacework” of the bees. In a tragic twist of fate, Dyck recently developed a life-threatening allergy to bee stings. As part of her efforts to find new ways of working with the insects, she enlisted the help of photographer William Eakin. Together they collaborated on Light (2010-2011), a sculptural and photographic project focused on human and non-human appropriations of found objects. For this project, Eakin placed a selection of vintage table lamps from his personal collection in the hives. Dyck participated remotely, giving instructions via a cell phone. Eakin then re-appropriated the completed sculptures in a series of distorted photographs that quietly fold collaboration back into estrangement. Nina Katchadourian’s work with spiders also supports the notion that they are motivated by more than pure instinct. Her video GIFT/GIFT (1998) shows the artist attempting to insert the word “GIFT” into a spider’s web. The insect actively resists this intervention, and a battle ensues. This project was inspired by a 1950s Swedish nature book describing certain cultural practices particular to spiders, which sometimes wrap dead flies in silk and then offer them as gifts to potential mates. (10) In Swedish, the word “gift” means poison, a doubleentendre underscoring the ambivalence inherent to any collaboration. Katchadourian’s photographic series Carla and a Friend (2002), on the other hand, casts this ambivalence in a more positive light, focusing instead on an unusual friendship between a pet snake and a rat she was originally given as food. Although the curatorial impetus for Animal Intent is rooted in the growing field of interspecies collaboration, it is also part of a personal quest to “unlearn the animal,” to borrow a phrase from Giovanni Aloi’s influential text Art & Animals (2012). Such an approach inevitably raises more questions than it answers, but this space of uncertainty feels more comfortable to me than either post-humanist utopias or humanist anthropocene. If we are to reimagine human/non-human relationships in ways that will ensure the survival of the planet, it seems vital to me that we attend as much to the lines that separate us as to the inherent porousness of these lines. This exhibition represents one small attempt to do so.